You are here: Home / Everyday Posts / What Would You Pay For Peace of Mind? When we moved into our new house… there was already a security system active. All I had to do was have it transferred over. And I did. It was comforting to know that there was somebody, somewhere, in some little control center was watching over the house. But… I often forgot to set it. It wasn’t user friendly. I had many false alarms where I was frantically trying to remember the password or the code… anything to shut it off! And the worst part? It was connected to my call center via a land line! Hello!? Everyone knows that murderers cut the phone lines first! Especially when it’s a cold and rainy night!!!!1!111!! Cox Security runs wirelessly. Take that, you phone-line cutting murderers! And… if for some reason… my murderer disables my Internet… Cox Security has back up cellular connection included. They think of everything! I’ve written a couple posts already about how my family is utilizing our new Cox Security system. The post, Home Security and Protecting my Family, focused on the specific features… like a camera at the door, so I can see who it is knocking. The kids know how to check it on the family tablet before they answer. I love this! It saves me from running up and down the stairs a thousand times a day! It also allows us to turn the lights on or off from our phone or to set timers. This is especially handy when I’m coming home to a dark house. Creepy! Our favorite thing to fight over to use… is the thermostat feature! Having a two story home… it’s warmer upstairs and it’s freezing downstairs. Our family control tablet is on the downstairs side table… by the couch. Conveniently… someone watching t.v. always seems to secretly adjust it! What will we be paying for this awesome peace of mind (once my term is up as a blog ambassador)? We’ll be paying the same price we were paying for the land line service with none of the awesome features our Cox Home Security has. So I ask YOU… What would you pay for peace of mind? And… does your current home security system protect against phone-line cutting murders? Seriously… tell me what you use for home security. Are you happy? Do you feel like you need home security? I want to hear all about it. Drop me a line or comment below or discuss it with me on Facebook or all of the above. 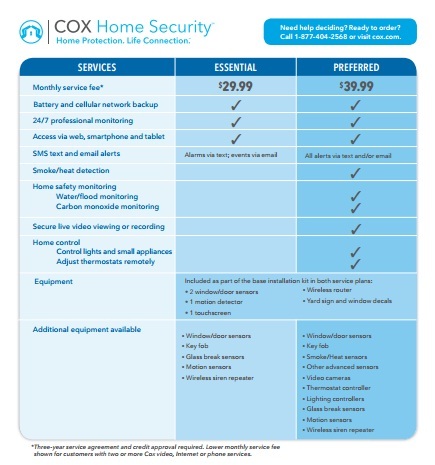 *Note- I have the pleasure of test driving Cox Home Security for a year. I have been compensated for my time. All views and opinions are my own and I value my integrity. I value YOU as my community and would never post anything that would compromise that.